At modern fashion jewelry market, both tungsten carbide and titanium are the beloved materials by rings designers. However, some of people can not judge well what's the difference exactly between them. So, let's move on to get some information related to do the contrast. You will surely have an idea which rings you should deserve. Tungsten carbide ring is very hard, it is about 4 times hard than Titanium ring, so it is very difficult for a tungsten ring to get scratched and quite easy to scratch a titanium ring. In weight. It is an obvious factor that titanium is a very light weight, thus some people are not quite sure they have a metal ring when wearing. While tungsten carbide is a hard and dense metal, tungsten carbide ring looks more durable and reliable. Especially for couples, they are willing to take the tungsten wedding band instead of titanium ring as tungsten rings takes them a strong sense of commitment and marriage. In colors. Titanium and tungsten carbide are the nature materials to be used in many areas. But they have a difference in colors. Titanium rings looks like steel, and it has the shiny silver color. For tungsten carbide, it is the dark grey in silver. With the time's pass by, tungsten carbide rings promises the original colors lifetime with the high polished shiny, and titanium may get lose its polish and need to be refinished. In laser engraving. As you known, tungsten carbide rings are four times as hard as titanium and virtually scratchproof. To meet the demands of wide consumers, tungsten carbide and titanium both allow the personalized words or patterns with laser engraving finish in the interior part. 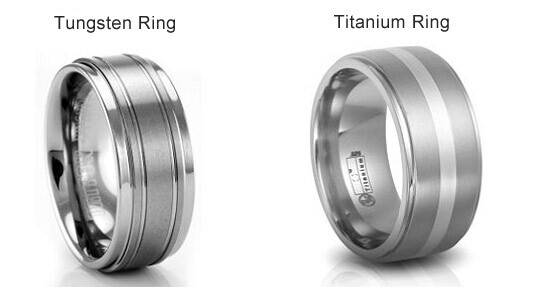 At this point, titanium ring is poorer than tungsten carbide ring. That titanium ring is so soft that can only carve some simple and traditional words. Tungsten carbide ring surely do more as the durability and variations. This is why tungsten carbide rings takes quite hold of jewelry market at recently years.